"When filmmakers from outside the Anglosphere recycle their earlier work into English-language remakes, the results are often disastrous. 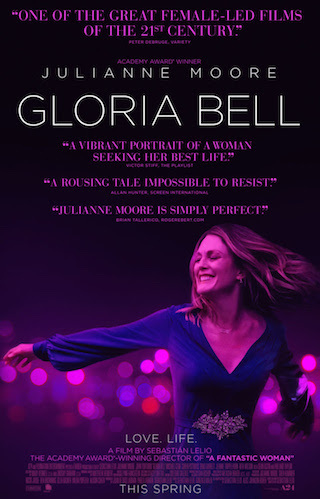 But Chilean writer-director Sebastian Lelio (A Fantastic Woman) continues his winning streak with Gloria Bell, a joyously bittersweet reboot of his 2013 Spanish-language prizewinner Gloria, which is graced by a finely etched and vanity-free lead performance by Julianne Moore." The Hollywood Reporter.